Aims : The purpose of this study was to evaluate the clinical pattern of external auditory canal (EAC) foreign body (FB) and management in the Garhwal hill region and to set guidelines for the management of EAC FB for the general practitioners in rural or remote settings. Materials and Methods : This study was undertaken in the outdoors and emergency of Otorhinolaryngology Department, VCSG Government Medical Science and Research Institute, Srinagar, Uttarakhand. Statistical analysis used : The data were analyzed using graph pad and SPSS version 15. Results : The age of patients ranged from 1 to 75 years. Out of 118 cases, most common FBs were insects (32), followed by beads (21), beans (16), and others. Maximum numbers of FBs were seen in age group 1-15 years and the most common FB in this age group was beads. Methods of successful removal included Alligator forceps (59), Jobson's probe (31), and syringing (28). Conclusions : Successful removal of EAC foreign depends on several factors. Patient's co-operation level is vital. FB removal techniques were more successful for irregularly shaped objects with soft and graspable parts in comparison to hard and rounded objects which were difficult to grasp with forceps. Syringing technique is the safest and easy. This study was undertaken in the Otorhinolaryngology Department of VCSG Government Medical Science and Research Institute, Srinagar, Uttarakhand. This retrospective study reviews all the cases of EAC FB presented to the Department of Otorhinolaryngology over a period of 2 years (1 st July 2009 to 30 th June 2011) and examines management practices and clinical outcome. The purpose of this study was to evaluate the effectiveness of EAC FB removal attempts by health care practitioners and to explore outcomes of patient with unsuccessful initial removal attempts. 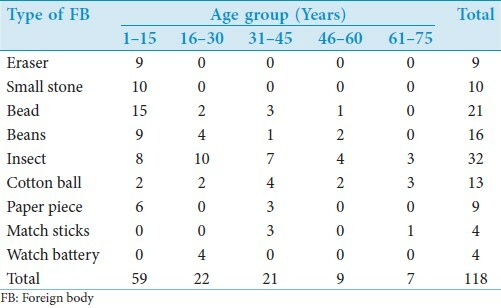 Prevalence of different types of FB and the age group in this area. To evaluate the methods of external manipulations done if any, before coming to this hospital. To set guidelines of the management of EAC FB for the general practitioners. The data were analyzed by using graph pad and SPSS version 15. A total of 118 patients with a diagnosis of EAC FB were identified during the study period. No attempt of removal of FB was done by doctors in the emergency department. All cases were directly handled by otorhinolaryngologist, proper history was taken, and after direct visualization treatment was planned. Otorhinolaryngologist used otoscope with standard otological instruments for initial diagnosis. Later according to the case need, management was planned. In all these cases, successful removal of FBs was done. Minimum age of presentation was of 1-year-old male with maximum age was of 75 years old female. Out of 118 cases, most common FBs were insects (32) followed by beads (21), beans (16), and others. Maximum numbers of FBs were seen in the age group 1-15 years and the most common FB in this age group was beads [Table 1]. Insects were commonly seen in the age group of 16-30 years. 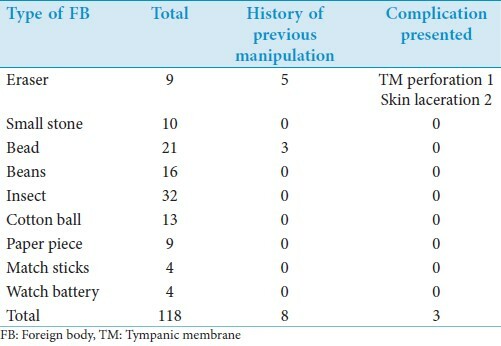 Previous history of manipulation by general physicians was present in eight cases, out of which one developed tympanic membrane (TM) perforation and two developed EAC skin laceration. There was neither any history of manipulation nor any complication in cases with small stones, cotton ball, paper pieces, match sticks, and watch battery [Table 2]. Out of nine cases with eraser as FB, five had history of previous manipulation. Out of these cases, three had blood clots in EAC and the remaining two were without any complication. When blood clot was removed, one patient had TM perforation and two had only laceration of EAC skin. Two patient developed laceration of EAC skin during the time of removal of FB. Three cases of beads had history of previous manipulation with no complication and removal was done under local anesthesia in otorhinolaryngology operation theater under visualization using Jobson's Probe. One case later developed perforation of TM. All 16 cases of beans were removed using Jobson's probe under direct visualization. Nine cases required local anesthesia and remaining seven required removals under general anesthesia in otorhinolaryngology operation theater as patients were not co-operative. No complication was seen. In 32 cases of insect FB, 20 were removed using Alligator forceps under direct visualization. 12 were removed using Jobson's probe. Four cases developed EAC skin laceration. All four cases of watch battery were removed under general anesthesia in otorhinolaryngology operation theater using Alligator forceps and Jobson's probe. Two patients developed EAC skin laceration and one developed TM perforation [Figure 1]. 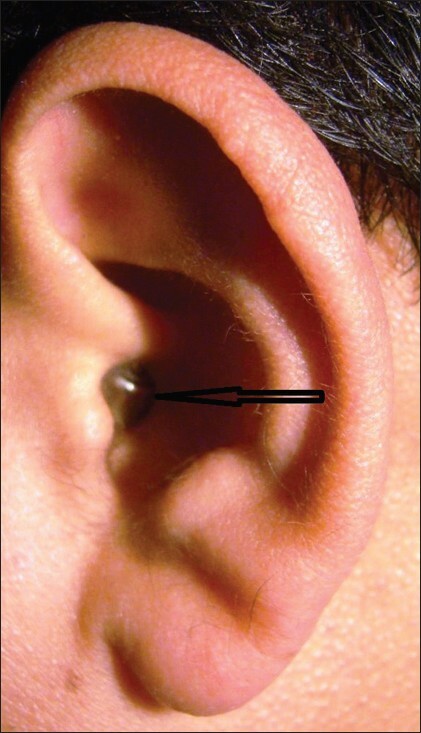 Figure 1: Wrist watch battery (marked by black arrow) in external auditory canal. In all cases, only 11 cases required general anesthesia, but even in cases done under local anesthesia (107) availability to conversion to general anesthesia is available. Method of successful removal with anesthesia according to FB type is tabulated in [Table 3]. It was observed that complications were mostly associated with the use of Jobson's probe followed by Alligator forceps. Only one case of TM perforation was seen as complication with syringing. FB removal techniques were more successful for cotton, paper, insects, and other irregularly shaped objects with soft and graspable parts in comparison to hard and rounded objects which were difficult to grasp with forceps. One peculiar observation was made that all the 4 cases of wrist watch battery removal were possible only under general anesthesia and three out of four cases were associated with complications (TM perforation one, skin laceration two). Removal of FBs of the EAC is a technically challenging job. Portion of the canal medial to isthmus is narrower and extremely sensitive, and even slight manipulations can result in severe pain. Even a co-operative patient will not tolerate more than one attempt. In addition to patient's morbidity, failed attempts also increase the cost of treatment. It was observed that complications were mostly associated with previous repeated failed attempts. In our study, spectrum of age groups from pediatric to old age group was found. Insects were the most common FB seen in this regional study. Insects were found in 32 (27%) cases in comparison to Thompson et al, in which it was 18%, perhaps because agricultural and cattle razing being a prominent occupation in this region. Of the insects, tick of animal Rhipicephalus sanguineus Latreille, ("atta" local regional language) was the most common one. Removal of this insect even after killing caused severe laceration of skin of the EAC. In the study of Thompson et al, cotton ball was the most common FB (22%) while in our study it was only 11%. Majority of our cases (107/118) required only local anesthesia for successful removal due to proper light source and instruments. Poor visualization and inappropriate instrumentation were the key factors behind the failure to remove the FB in the cases with history of manipulation by general physician. One peculiar finding in this study was wrist watch battery as FB ear, which is a round and hard objects, not seen in any other study. It is very difficult to grasp with a forceps and with every attempt to grasp, it is pushed more medially. All the cases of wrist watch battery were removed under general anesthesia and frequently associated with complications (75%). Maximum numbers of complications were associated with Alligator forceps (skin laceration 8, TM perforation 2). It was also observed that the hard and rounded objects that are difficult to grasp were successfully managed with syringing which was also associated with minimal trauma to the canal and TM. There was only one case of TM perforation associated with syringing. Successful removal of EAC foreign depends on several factors. Patient's co-operation level is vital; no attempt of removal should be taken under local anesthesia if patient is not co-operative. Before instrumentation, proper history about the type of FB, duration of impaction, and presence of coexisting otitis externa or trauma to the canal is essential. During instrumentation, proper visualization of FB and essential instruments are must. No attempt of removal should be taken in absence of proper light source and instruments. We are highly thankful to our Principal Dr. V.L Jahagirdar, who allowed us to conduct this study and provided us necessary support for the same. We are also very thankful to our staff for necessary technical support to conduct the study. Finally, we express deep appreciation to the patients who willing provided us information utilized in this study. 1. Thompson SK, Wein RO, Dutcher PQ. External auditory canal foreign body removal: management practices and outcomes. Laryngoscope 2003;113:1912-5. 2. Bressler KB, Shelton C. Ear foreign-body removal: a review of 98 consecutive cases. Laryngoscope 1993;103:367-70. 3. Schultze SL, Kerschner J, Beste D. Pediatric external auditory canal foreign bodies: a review of 698 cases. Otolaryngol Head Neck Surg 2002;127:73-8. 5. Balbani AP, Sanchez TG, Butugan O, Kii MA, Angélico FV Jr, Ikino CM, et al. Ear and nose foreign body removal in children. Int J Pediatr Otorhinolaryngol 1998;46:37-42. 6. DiMuzio J Jr, Deschler DG. Emergency department management of foreign bodies of the external auditory canal in children. Otopl Neurotol 2002;23:473-5. 7. Mishra A, Shukla GK, Bhatia N. Aural foreign bodies. Indian J Pediatr 2000;67:267-9. 8. Ansley JF, Cunningham MJ. Treatment of aural foreign bodies in children. Pediatrics 1998;101:638-41.